Replicating 3D-recorded movements of professional chefs, this culinary machine is designed to stir, pour, adjusts temperatures and adds ingredients so as to be indistinguishable from having a world-renowned cook right in your kitchen. The trick is not, however, in the capturing, but in the complex robotics that go into making something that can simulate the movements of hands, in this case using 20 motors, 24 joints and 129 sensors that can properly mimic human motions. Mark Oleynik, founder of Moley Robotics, expects their machine to hit mass-market production in 2017, serving demand initially in commercial and then home kitchens, with eventual applications that could go well beyond just cooking. 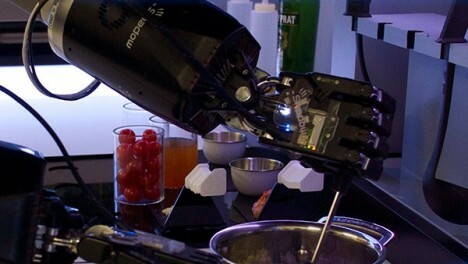 Users will be able to use their computer or mobile device to pick any one of thousands of dishes and instruct their robots to make them remotely so their meal is ready and waiting when they get home. 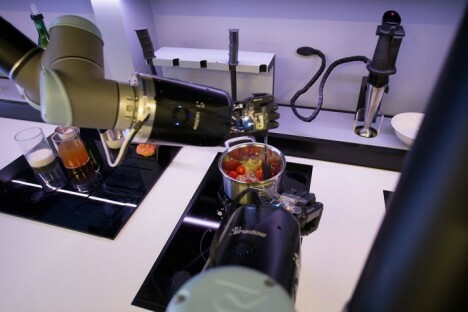 While this is far from the first attempt to turn robotics to cooking, it is probably the most complex such endeavor to date – other cooking bots can boil, stir and do other basic tasks, but not fully replicate the processes of a professional. See more in Robotics or under Technology. May, 2015.